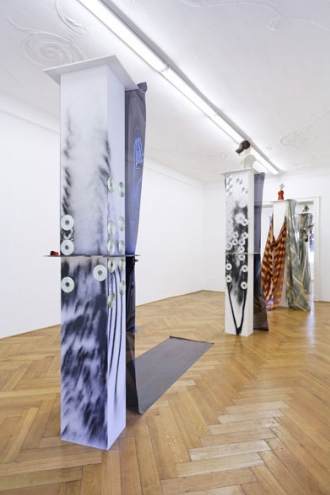 Currently on view at Galerie Daniel Buchholz through January 30, and running concurrently with an exhibition at Gallery Neugerriemschneider also in Berlin, is a collection of new works by the German artist Isa Genzken (b. 1948). 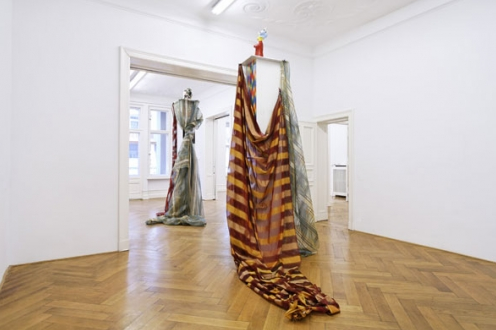 Displaying provocative sculptures and collages blending paper, metal, paint, fabric and ceramics, the exhibition is the artist’s ninth solo show at the gallery since 1987. Embodying the artist’s idiomatic style of arranging chintzy, ready-made materials, Wind constitutes a series of textured, totemic structures replete with fanciful juxtapositions. While the sculptures exude playful irony in their myriad associations, the artist’s saturated approach also levels a more serious critique at our contemporary society fueled by excessive consumerist urges. Genzken’s multimedia collages undermine conventional hierarchies and methods of aesthetic decision-making. Wind I (David), for example, incorporates pop culture and Classical references without rational bias. If Genzken’s work, integrating ersatz and discarded paraphernalia, consistently draws attention to a tactile facade, Hommage à Jasper Johns seeks instead to conjure the artist’s process by interjecting formal, geometric rhetoric into the mayhem. In Wind, the theme of Michael Jackson is elaborated alongside gauzy, statuesque configurations seeming to waltz through exhibition corridors. This bizarre coupling of consummate symbol of glamour with abstract, psychedelic construction defies any clear narrative reading; paradoxically, everything is left to the viewer’s interpretation. Yet, in all its flaunted ambiguity, Wind cites definite influences of natural elements. Employing Minimalist objective abstraction, Wind elegantly neutralizes objects and sheaths of fabric to strike a delicate balance between anarchic assemblage and the defining of materials as equal, compositional elements. In Wind II we witness the roots of Genzken’s collage aesthetic: a spontaneous praxis entrenched in art theory. Imaginative albeit jumbled iterations of Michael Jackson allude to iconic Dada photo-montages. 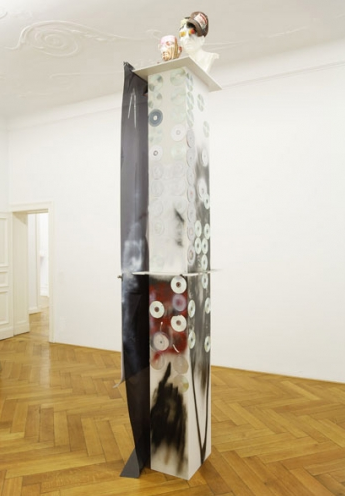 Below, in Wind (A), Jackon’s image, immortalized in dark geometric effigy, more specifically pays tribute to the paper column collage constructions of the Surrealist, Hans Arp. This dramatic representation of the high-flying Michael Jackson, enveloped in black yet youthful and exuberant, forms a powerful juxtaposition to the above-referenced Wind I (David) as well as Michelangelo’s David. By appropriating disparate symbols of masculinity, Genzken calls into question our modern day ideals. All images via Galerie Daniel Buchholz unless otherwise noted. This entry was posted on Monday, January 4th, 2010 at 8:45 pm	and is filed under Go See. You can follow any responses to this entry through the RSS 2.0 feed. You can leave a response, or trackback from your own site.